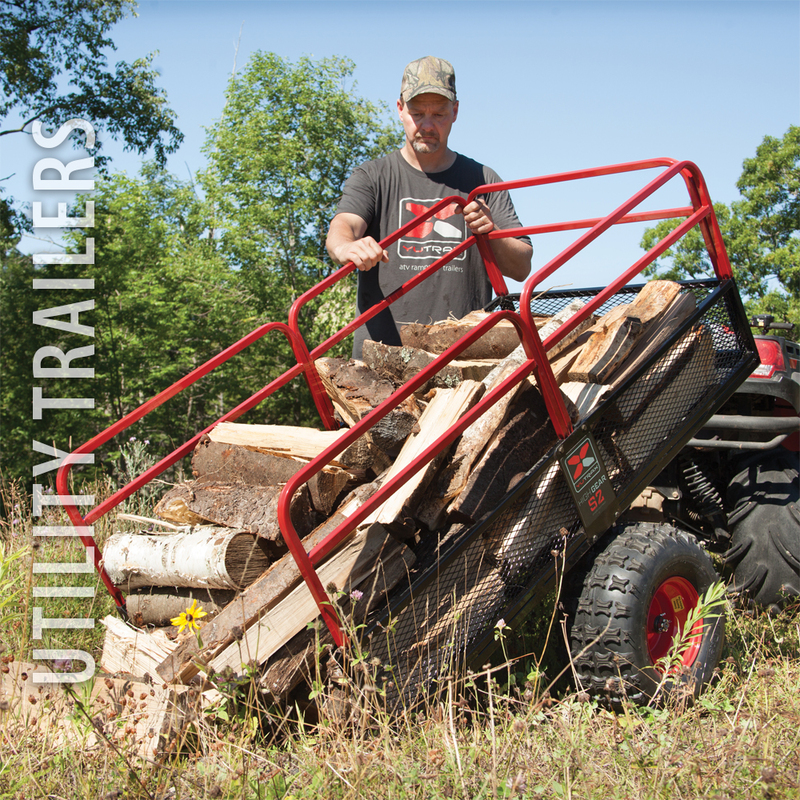 YUTRAX utility trailers are designed and built with hard work and rough terrain in mind. 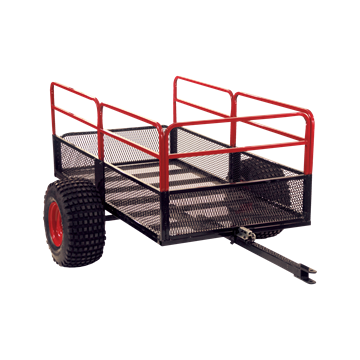 They’re constructed from heavy-duty steel and feature large flotation tires and removable rails. The Yutrax™ High Gear™ series of trailers feature a raised axle that allows for a higher ground clearance when transporting loads off road. This added clearance also increases the tilt on the trailer bed which allows the trailer contents to be dumped completely. The S2™ model is constructed of a steel mesh bed, made to withstand abuse from every­day load. The High Gear™ S2™ is lightweight and durable. 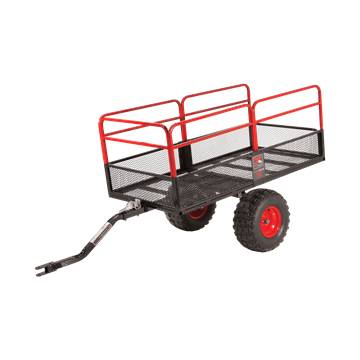 Yutrax X2 series of trailers are lightweight and durable. The steel mesh-constructed bed withstands abuse from everyday loads. The bed also features a pivoting tongue and dumping feature for easy unloading. 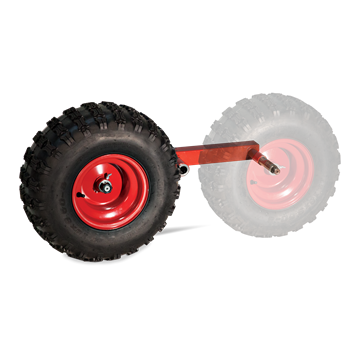 Yutrax’s X4 series of trailers feature four large off-road wheels fixed to a pivoting tracking beam. Full trailer loads ride smooth and "walk" over logs and rocks. A durable metal basket withstands abuse from rocks, logs and other punishing loads. 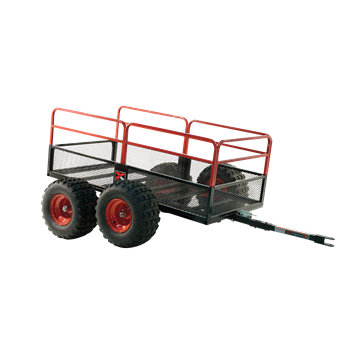 This kit will convert your Yutrax X2 ATV trailer (TX158) to the four-wheeled X4 ATV trailer (TX159). The kit features exclusive, heavy-duty pivoting attachment arms that ride over the contour of the ground, making for less bounce and smoother tow. With Yutrax’s ball hitch kit you’ll be able to convert Yutrax ATV trailers(trailer not rated for on-road use) from a pin-style hitch to a 2” ball hitch. Easy to install, all hardware included. With Yutrax’s ball hitch kit you’ll be able to convert your Yutrax S2 High Gear Off-Road ATV Trailer (trailer not rated for on-road use) from a pin-style hitch to a 2” ball hitch. Easy to install, all hardware included.